Media and newspaper companies have had dismal fortunes last year, and book publishing is no exception. Layoffs, mergers of imprints, declining sales, rising costs -- all put the biggest publishing houses deep in the red in the last two quarters of 2008. But the latest quarterly numbers coming in tell a more optimistic story for their massive parent conglomerates. Lagardere's (LGDDF) preliminary Q1 earnings report, released Wednesday, won't have anyone popping Champagne bottles. Consolidated revenues for the first nine months of 2009 fell 3.7% (or 3.9% on a like-for-like basis) to €5.8 billion ($8.6 billion); the magazine and broadcast divisions alone fell 19.1% for the first quarter. But the publishing division, including Hachette Book Group USA, has been a rock for Lagardere -- thanks to Stephenie Meyer's Twilight novels, which have been a rock for Hachette. 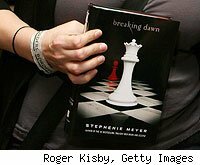 It's been almost a year and a half since the last book in the Twilight series, Breaking Dawn, was published, and its massive sales spike would be tough to sustain for so long. But foreign sales and film versions are keeping Lagardere in good spirits, lifting its overall publishing sales 4.5%, to €684.6 million ($1.02 billion) for the quarter, including a 15% increase for Hachette Book Group USA. The Twilight phenomenon won't last forever, so Lagardere's outlook for 2009's final quarter is more cautious. But it was cautious a year ago, too, yet Lagardere reported a 6% sales growth for Q4 of 2008. For News Corp.'s (NWS) HarperCollins, the definition of "good news" is more muted. That publisher has been among the hardest hit over the last year, especially in the first two quarters of 2009. Sales continue to decline, but its Q3 revenue of $310 million was only a $5 million drop from last year -- and it's an improvement over sales in Q1 ($243 million) and Q2 ($278 million). But HarperCollins generated better news with the report of $20 million in operating income, snapping a two-quarter losing streak -- and considerably up from the dismal $3 million reported a year earlier. HarperCollins's fortunes echo those of its parent: News Corp. beat expectations, reporting an 11% rise in its quarterly profit, to $571 million. But the best news of all comes from up north. While Toronto-based Torstar Corp.'s (TORSF) overall results took a hit, sales at its Harlequin romance-publishing division are booming -- up 3.7% from a year ago, to C$122.5 million ($114.7 million) in sales, with operating profits rising 22% to C$22.9 million ($21.6 million). A strong Canadian dollar and foreign exchanges account for a large chunk of profit and sales gains, but Harlequin's success contrasts that of its parent company, reflecting readers' need for escapist romance when times are tough: a scenario that also played out during the last major recession in the early 1980s. Bertelsmann and its Random House division haven't reported their quarterly results yet, and their news isn't expected to be so hot. But the encouraging numbers within the book business have been a surprising point of light for the companies that own them.